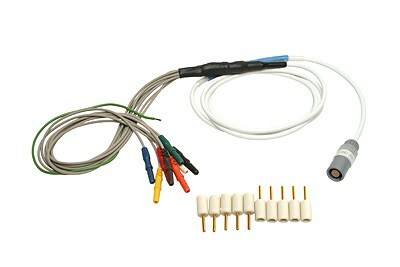 Thank you for your interest in EPR Catheter Interface Cable (5 ft). Please complete and submit the form below and an ADInstruments representative will aim to get in touch within one working day. If you’d like to speak to someone immediately, office contact information is available from the contact page. Connects Millar Electrophysiology Catheters to any ADInstruments Bio Amp or directly to the Quad or Octal Bio Amp. Estimated delivery time: 2 months. Connects Millar Electrophysiology Catheters (purchased separately) to an ADInstruments Octal Bio Amp for recording up to eight intracardiac electrophysiological parameters. It can also can be used to connect to other Bio Amps if fewer recording parameters are required such as the Quad Bio Amp. The cable has a Redel connector to eight (8) 1.5 mm shrouded sockets. It also includes a pack of ten (10) 2 mm pin adapters to allow connection to older discontinued Animal Bio Amps.